In this trolley, you can store much studio equipment. This makes it ideal for, e.g., transporting your equipment to a shooting location or to store it optimally when not in use. 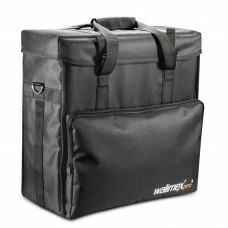 From the studio flash to tripods – your equipment is perfectly stored in the studio bag by walimex pro. The interior can be adjusted individually and is well-padded in order to protect sensitive devices.On the inside, the padding is joined with the corpus via a zipper; this improves the stability and rigidity of the case. Additionally, the inner compartments can be separated from the rodding, e.g. for cleaning or replacing the lining.